Toward. Some. Air. is a landmark collection of profiles of contemporary poets, statements, essays, and conversations about contemporary poetry and poetic practice, and a few exemplary poems selected by up-and-coming poet and scholar Amy De’Ath and Governor General’s Award-winning, former Parliamentary Poet Laureate Fred Wah. The (over 40) contributors to this anthology are renowned poets and academics from Canada, the United States, and the United Kingdom. 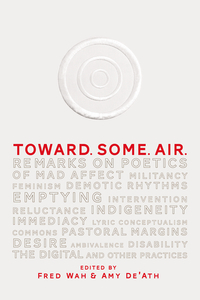 According to De’Ath and Wah, the book is “an open invitation to consider the contours and meaning of anglophone poetic practice as a mode of interpreting the world.” Toward. Some. Air. is an invaluable critical resource because of its unprecedented scope; with contemporary poetics regarded from all angles and criticism shared from many different backgrounds; designed for readers, students, teachers, and writers for the future of creative writing pedagogy and practice.